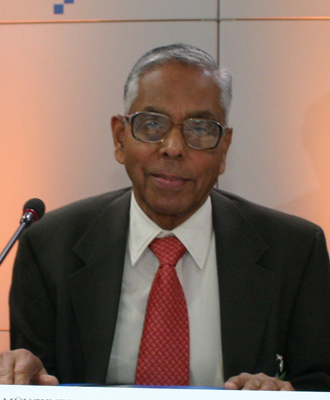 M K Narayanan is an immensely experienced Indian diplomat and former IPS officer. He is an expert in security matters and shares the wisdom gained through his service with the Indian government, on topics like national security, Indian politics, and policies, etc. He started his career as an IPS Officer in 1955, graduating as ‘The Best All-Round Officer’ of his batch. Post a brief stint as a sub-divisional police officer in Madras, he went on a deputation to the Intelligence Bureau (IB) in February 1959, where he managed a range of issues concerning internal and national security. He headed the IB from 1987 to 1990, before heading the Joint Intelligence Committee. He became Chief of the IB again in 1991, before retiring in 1992 – which was also the year when the government of India awarded him with the civilian honour of Padma Shri. He served as the Special Advisor for Internal Security to the Prime Minister of India beginning in 2004 and became the governor of West Bengal in 2010. He was awarded the Gusi Peace Prize in 2011.